Here's some information to help sailors organise their holiday in Sète. Sète has a fishing port, a commercial port with ferries to Morocco, and various sailing facilities. Access to some quays inside the town is linked to the opening of the bridges (lift bridges or swing bridges) which allow entry to the canals. This marina accommodates 480 boats around the old port and the Môle St. Louis jetty, allowing you to disembark right in the heart of town and another 200 are being developed near Sète train station. From mid-June to mid-September 07:00-21:00, 7 days a week. From mid-September to mid-June 08:00-12:00 and 14:00-18:00 from Monday to Friday. Moorings can be booked in advance. 1 crane, dry dock area, toilets/showers and fuel. Rates according to vessel length, season and duration of stay. Located near the beaches as you leave the town heading towards Marseillan and Cap d'Agde. 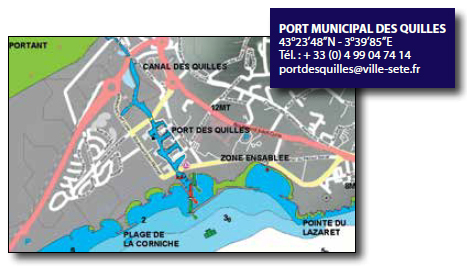 The Port des Quilles is managed by the Municipal Authority run by the town of Sète. 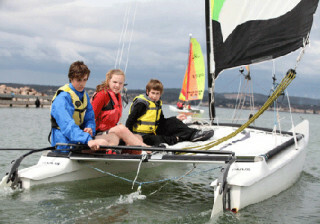 Sea rescue, and rescue on the Etang de Thau lagoon, CROSSMED (Toulon). 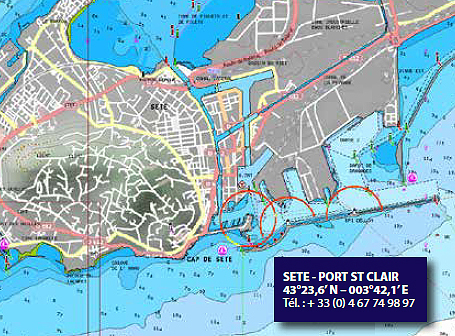 VHF Channels: Marina - channel VHF9, Commercial port - channel HF 12, Sète Semaphore - channel VHF 16. Tel. 33(0)4 67 46 34 36 or channel VHF12. Sea/Lagoon: 09:15 / 10:40 and 18:40 / 19:30. Lagoon/Sea: 10:20 and 19:15 Times are subject to change (+/- 20mins) depending on trains. • From Monday to Sunday: reservation essential 1 hour 30 mins in advance. • Weekends, public holidays and Monday of the St Louis festival (local festival in late August): reservation on the previous working day before 19:00.